1.) What are the hours of operation? We are open 6:30 AM to 6:30 PM – Monday through Friday. We are open year-round except for the following holidays: New Years Eve, New Years Day, Good Friday (Staff In-Service Day), Memorial Day, Independence Day (July 4th or nearest weekday), Labor Day, Columbus Day, Thanksgiving Day, the day after Thanksgiving, Christmas Eve, and Christmas Day (December 25th or nearest weekday). If Christmas falls on a Saturday, the Center will close the Friday before Christmas. If Christmas falls on a Sunday, the Center will be closed the following Monday. There is no reduction in fees for these days. 2.) When can I come in for a tour? 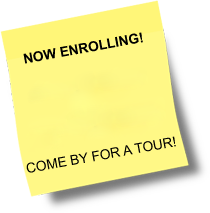 You do not need to schedule an appointment for a tour. Please come by anytime between 9:00 AM and 2:00 PM. If you need to tour our facility before 9 or after 2, just give us a call and we will be happy to accommodate you. 3.) How many children are in a class? Group sizes and child-staff ratios are always maintained within the limits of the guidelines of the Minimum Standard Rules for Day Care Centers published by the Texas Department of Family and Protective Services. Often times, our classroom ratios are even lower than required by the state standards. 4.) Do you offer vacation time (Reservation Time)? Your child maybe absent Monday through Friday on any week and your tuition will be reduced to half of their normal tuition rate. Reservation time(formally known as vacation or absent credit) can be taken up to 2 weeks consecutively. This does not apply to MDO or CCMS students. The 1/2 rate tuition is still due on Monday by close of business. Late fess still apply. Other fees applied during that week will not be reduced. 5.) What are the enrollment requirements? All enrollment requirements can be found on our ‘Forms’ page. You may download all required forms directly from this website. We will also need an updated copy of your child’s immunizations and a statement from the doctor (see Medical Record). 6.) How much does it cost? Country Acres CDC offers competitive rates. Be sure to print the coupon located on the Home page for additional savings! A Child Care Tuition Rates can be obtained from our office or by calling 817-232-5458. 7.) Are meals included in the tuition? Yes. The Center provides a breakfast, lunch, and an afternoon snack for all children in attendance. Menus are posted and copies may be obtained at the front desk. A variety of nutritious food is prepared and served, giving your child a balanced diet each day. Country Acres does not allow food to be brought into the center. 8.) What time are meals served? Breakfast for Infants through Pre – K is from 8 AM to 8:25 AM. Lunch for Infants through Pre – K is from 11:15 AM to 11:45 AM. Afternoon Snack for Infants through Pre – K is from 3 PM to 3:30 PM. 9.) What type of payments do you accept? At this time, Country Acres CDC accepts checks, money orders, cashier’s checks, ACH, Credit and Credit/Debit Cards including: Visa, Mastercard and Discover. 10.) What security measures are followed to ensure my child’s safety? We have video cameras throughout the building and on the playgrounds and Splash Park. These are motion activated and are designed to record movement and audio sounds. We require persons picking up children to register with us through our advanced bio-metrics system. This system is set up to allow entrance to your child’s classroom from the front office area. All of our staff members are required to submit to a criminal history check when hired and every 2 years thereafter, as well as an FBI fingerprint background check. 11.) What type of training do teachers at Country Acres CDC receive? Our teachers receive a minimum of 24 hours training in Early Childhood/Child Development each year, as well as CPR and First Aid training every other year. Recognizing Abuse and Neglect, SIDS, shaken baby, Head Trauma, blood bourne pathogens, and transportation safety are annual trainings required in addition to the 24 hours. 12.) What type of programs do you offer? Infants, Toddlers and School Age – Pinnacle Curriculum is a developmentally appropriate, easy-to-use program that is based on current developmental and brain research. It provides center-based, hands-on learning activities to promote the skills development in language and literacy, fine and gross motor, problem-solving, social/emotional skills, science and sensory, creative arts, mathematics, dramatic play, music, and outdoor play. The activities meet learning objectives, promoting exploration and experimentation through materials and activities in the classroom. the program materials provide a detailed curriculum guide. Early Preschool through Pre – K – The InvestiGator Club™ Prekindergarten Learning System is a comprehensive, fully-integrated curriculum complete with all the literature, components, and teacher support you need for a full year of Early Preschool and pre-K learning and fun. This program builds upon children’s natural curiosity about the world and their place in it. “Purposeful Inquiry,” the heart of The InvestiGator Club, awakens the scientist and the explorer in every child. Children learn to use their senses, ask questions, and find answers in a supportive, print-rich environment. An overview of the curriculum for the calendar year is provided to parents upon enrollment. Country Acres education curriculum includes: Spanish is Fun with Rosi, Drama, Art, Music & Movement, Geography, Biology, Science, Literacy, Math, Baby Sign Language, and more. To learn more about the curriculum you may visit the InvestiGator Club website. 13.) Where can I find more information on my child’s classroom? Information for each classroom is posted under the ‘About Us’ pages on this website. 14.) Where can I find more information about your summer program? We offer Summer Camp to children ages 18 months through 12 years. 15.) Where can I find information about your Splash Park? Our Splash Park hours of operation, classroom participation schedules (subject to change) on the ‘Splash Park‘ tab on this website. 16.) Do children go on field trips? During the summer, school age children will go skating, bowling, on tours, or to similar locations. Field trip calendars will be provided along with permission slips during the summer. During the school year, permission slips for each field trip will be sent out, 48 hours in advance of the field trip. Permission slips must be signed in order for the child to participate in the field trip. 17.) Do you offer transportation to and from public schools and ILT? We provide transportation to and from several area public schools. Come by the center for a list of currently serviced schools or give us a call at 817-232-5458 to see if we provide transportation to and from your child’s school. We are not able to provide transportation for children attending Pre-K, or half-day programs at Public Schools or Development Centers. 18.) What items do I need to provide? Babies need diapers, wipes, several changes of clothes, pacifier (if needed), and enough bottles for each days’ feedings. Under the guidelines of CACFP, Country Acres CDC provides “Parent’s Choice” POWDER formulas: Advantage with Iron, Premium with Iron, Gentle with Iron, Sensitivity with Iron, or Soy-Based. If parent chooses not to participate in the Food Program, parents must bring at least 4 prepared bottles each day, and enough baby food and/or cereal for each days’ feedings. This ONLY APPLIES TO CHILDREN UNDER THE AGE OF 12 MONTHS. Home-made baby food and cereal are also offered by the center through the Food Program at no additional cost. Older children need two changes of clothes, diapers/pull-ups or underwear, a sweater or jacket for outside play and a crib sheet and small/light blanket set (all of these are available for sale in our front office). We ask that all children wear socks and tennis shoes or sneakers that tie. Be sure to remember to label your child’s belongings with his/her name (Markers are available at the front office). 19.) How do I know if the school is closed for bad weather? Country Acres follows the same weather schedule as Eagle Mountain/Saginaw ISD! If the school is closed for inclement weather then Country Acres will be closed also. Please see the weather closing information at EMISD.COM.